Delaware Arts Info: Head to 42nd Street – And Dance, Dance, Dance! Mary Ellen Hassett has lived and worked in Delaware since 1996 as a paralegal and attorney. She and her husband Keith enjoy Wilmington arts and culture and devote a lot of volunteer time to Delaware Humane Association. The musical 42nd Street – The Song and Dance Fable of Broadway – opened with the full cast tap dancing to Audition. This high-intensity performance engaged the audience from the beginning and lasted the entire show. Director and co-author Mark Bramble with choreographer Randy Skinner did a magnificent job in casting, directing and bringing to life the story of Peggy Sawyer (Caitlin Ehlinger), a young dancer from Allentown, PA who came to New York to audition for her first show, Pretty Lady. Peggy gets her chance to shine when the lead in Pretty Lady breaks her ankle and Peggy is asked to step in by the director Julian Marsh (Matthew J. Taylor). You'll definitely recognize several of the hit songs from this performance like We’re in the Money, I Only Have Eyes for You and 42nd Street. All of the dancers were phenomenal, but you definitely do not want to miss the lead male dancer who plays Billy Lawlor – Blake Stadnik. Although blind since age seven, Blake led the dance routines flawlessly and captured the audience with his smooth style, charisma and charm. Enough cannot be said about the great choreography and costuming for this performance. 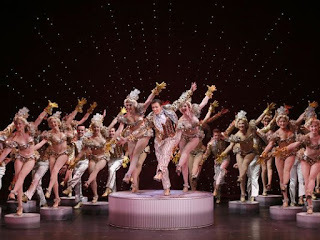 The full cast is used in most scenes, and it was amazing to see how they were able to fit this large group onto the small stage and execute the dance sequences with such grace and excitement. The costumes were colorful and unique and added a lot to the overall presentation. The staging for this show is rather simple, but with all of the great choreography, costuming and dance, there is no need for anything more! Although a musical, this performance has many comical highlights that the audience fully enjoyed. If you want to see one of the best musicals that has come to Delaware this year, come and see 42nd Street! The show runs at The Playhouse thru April 24 during the following times: Wednesday and Thursday evening performances at 7:30pm; Friday and Saturday evening performances at 8:00pm; Wednesday, Saturday and Sunday matinees at 2:00pm. Ticket prices range from $40-$90, and discounts are available for groups of 10 or more.